For the Fall and early Winter Half and Full Marathons: Chicago to Disney and everything in between! If you can run a 5k now, why not train for a longer event? 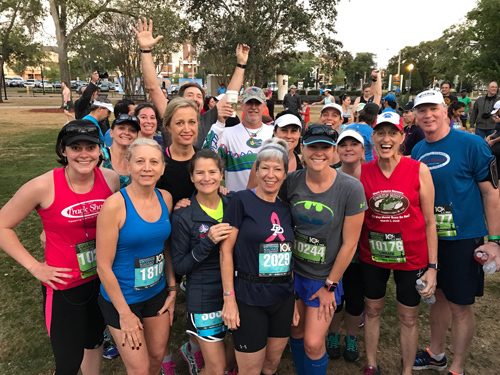 MarathonFest’s Summer/Fall training session is a 3 day-a-week training program for the Half and Full Marathon distances. Our three day-a-week training schedule is adequate training for most runners to achieve their goals, but it can also be supplemented with additional run days for those desiring more volume. All participants receive a weekly email from the Program Director with detailed training information for each week. Tuesday/Thursday workouts are offered in the morning at 5:00 am or the evening at 6:00pm. Tuesday is Speed day and we offer a track workout or mile repeats. Thursday is Strength day with a focus on Tempo or Hill runs. Weekday workouts are not organized by Pace Group so runners may attend either workout that best fits their day. Chicago, MCM, NYC, and Space Coast Marathoners start training at 10 miles. Jacksonville and Disney start training at 4 miles. All Half Marathoners start training at 4 miles. for distance runners. Meet at the Glenridge Middle School track. for building strength and stamina. Meet at Glenridge Middle School. and 5:30 am and are determined by Pace Group Leaders. Please check Pace Groups to see if there is a suitable pace group for you. Starting weekend mileage depends upon your targeted race. Runners must be able to fit in with one of our Pace Groups. training program within the last two years. who signs up for MarathonFest after the start date. Runners unable to meet MarathonFest’s prerequisites are encouraged to join one of our other training programs. Weekday workouts are offered both in the morning and the evening on Tuesdays and Thursdays. These workouts are NOT organized by pace group, so runners may attend either workout that best fits their day. Just show up ready to run. If you cannot make the weekday workouts, please run similar mileage on your own. Training programs run in the rain! Coaches are present for every workout and workouts are only cancelled if lightning is present in the area at that time. Refund and Late Fee Policy- The Training Fee is NON-REFUNDABLE. Runners registering AFTER the start date will be charged an ADDITIONAL $25 FEE. Please note that the price of the program is not pro-rated based on attendance. NOTE: The Track Shack Fitness Training Programs are designed for persons over the age of 18. Persons younger than 18 interested in training, should check with their school for running/fitness programs or check out Cheetahs Running Club.